Bus from Penang to Cameron Highlands is one of the well-known traveller routes in Malaysia because the bus service links up two popular tourist attractions in Malaysia. Cameron Highlands is one of the famous hill resorts in Malaysia. Some of the buildings in Cameron Highlands still preserve the charm of English village, and jungle trekking is the most popular activity for visitors coming to Cameron Highlands. Unititi Express and Billion Stars are the only two operators serving bus from Penang to Cameron Highlands. Their bus fare ranges from RM32.00 to RM 45.00. The duration required for bus from Penang to Cameron Highlands is about 3 hours depending on traffic condition. The buses run either early in the morning or at noon, with a total of 7 departures daily. Washroom breaks will be provided upon request to the driver during the journey. All express buses are either departing from Sungai Nibong Bus Terminal or from Komtar. The coaches will normally make a stopover in Ipoh for alighting and boarding passengers before continuing the journey to Cameron Highlands. (Note: Ipoh is the last town before climbing the mountain). The arrival point in Cameron Highlands is at Tanah Rata Bus Terminal. From the terminal, visitors can easily get a taxi to go to your pre-booked resort in Cameron Highlands. Because of the limited daily trip from Penang to Cameron Highlands, It is always better to book your Penang to Cameron bus ticket in advance in BusOnlineTicket.com to avoid disappointment. BusOnlineTicket.com is the largest ticketing portal in Malaysia and Singapore offering online booking service with instant confirmation and seat selection feature. 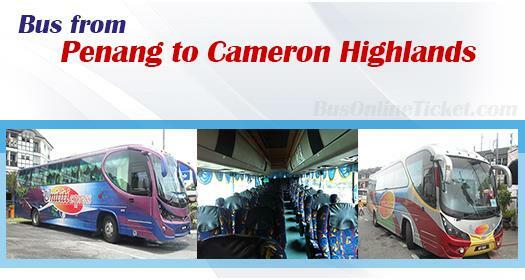 Secure your seat now by booking your Penang to Cameron bus ticket in BusOnlineTicket.com.